Choose one of our 3 or 5 class pass packages to save 10% or more on our open beach yoga classes on Folly Beach island, SC. Our class passes are accepted for our public beach yoga classes as well as our weekend classes upstairs at St. James Gate Irish pub (in the Greenroom). Check out the details on our class pass along with our weekly schedule here. If you’re visiting the Charleston, SC area adding a beach yoga experience or a yoga class upstairs at St. James Gate Irish Pub on Folly Beach are great options to add to a day trip, family vacation week, or getaway weekend. Plan to add Folly Beach Island Yoga to your itinerary of things to do in and around town while you’re here. 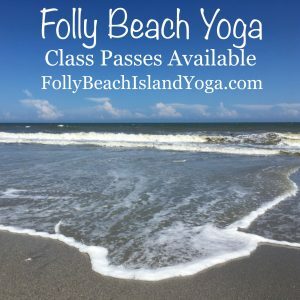 Whether vacation or if the Lowcountry is your home all year choosing a class passes are a great way to save some money on your Folly Beach yoga experience.